We've always tried to institute "Family Game Night", but that rarely happens, with the kids' crazy schedules, especially now that Adam is in high school and has a girlfriend (!!?!!). 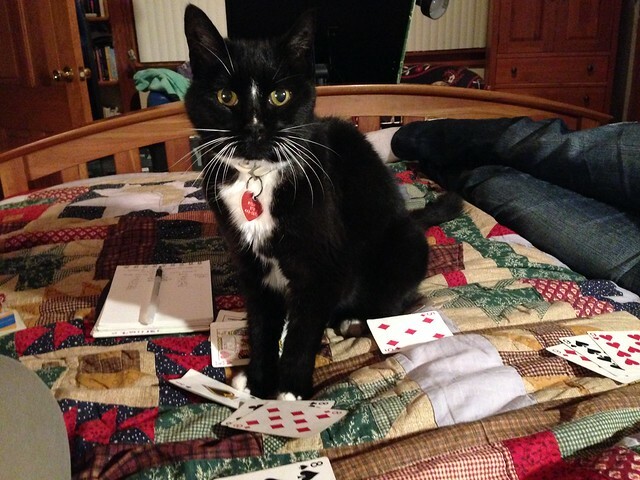 But there's always time for a card game with them and sometimes a cat too. Apparently lots of people believe in playing card games and passing it on to their children. Here are two examples from This I Believe: My Legacy of Playing Games and The Cards Will Hear You. Growing up, I played a few card games with friends, but having no siblings, I mostly spent time making up my own Solitaire games. 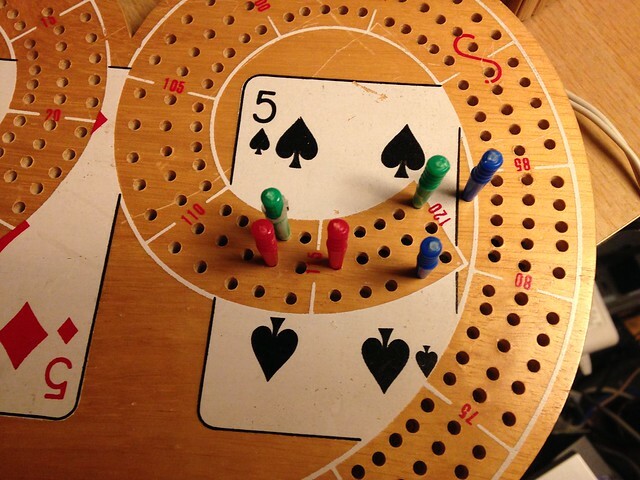 When I went to college, I spent many hours playing Cribbage and Canasta with a friend who was also an only child but was fortunate to play with her grandmother. By the time I started work, I got hooked on Hearts and Spades, getting really good at counting cards. I loved the rush of shooting the moon in Hearts, hence my username, moonfever0, as well as bidding a zero hand in Spades. Our games were mostly civilized but sometimes borderline violent! Adam (in green) and Dova (in red) were tied for the lead at 114 (back pegs as shown). I (in blue) was trailing at 107 (not shown). I led off with 7. Dova also played a 7, giving her 2 points for the pair (red peg as shown). Adam played another 7, giving him 6 points for the double pair and landing him in the dead hole closest to the finish (green peg as shown). I came back triumphantly with the last 7, giving me 12 points for the four of a kind (back blue peg). It was a Go for Dova, and a Go for Adam, and then I put down a 3 for 31, 2 points and the win (blue peg in the winning hole)! At this point, Adam kicked Dova for the first 7 she put down and she flew off the bed (bed shown in the first photo). All mayhem ensued! At least I never lied to Adam. Without doubt, Dova overbid and ending up sandbagging two points. Playing cards clearly sharpens their minds and teaches them life lessons on losing gracefully (still working on that!). Most importantly, it gives them a lifelong activity that they can pass down to their children too. Long live card games!